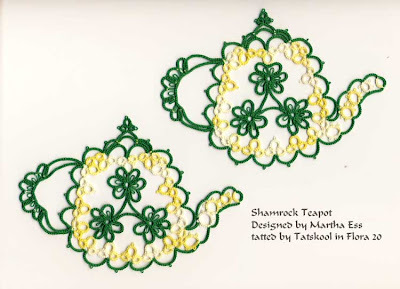 TATS A KOOL CHALLENGE: Happy St Patrick's Day and Time for Tea! I can't believe that it's over a year ago that I test tatted Martha Ess's Shamrock Teapot for her Book 'Tatted teapots' and showed you here. Spring is really in the air, the weather has been glorious for the last few days,the most beautiful pink skies at night, daffodils in bloom. So I re tatted the teapot to give to a friend, had to be exactly the same as I couldn't bear to part with the original. WHAT WOULD IT LOOK LIKE IN DIFFERENT COLOURS??? Maybe a different green..more real shamrocky and for the surrounding flowers...well they had to be daffodils didn't they! My Just Daffodils was just right! I had lots of greens in Flora,Coats Mercer and Cebelia and even DMC in 20 to choose from...and picked one in Flora. I couldn't resist adding a few beads...I thought that the handle looked lovely...but the lid seemed a bit 'feeble'! I am in 'Teapot' mode at the moment and decorated my new Art Deco silver and crystal tree with teapots. These new ones are a little too big so methought to tat it again in a 40. Just Daffodils was there waiting for me in but darn I didn't have a solid green. But I did have both in a Coats 30....so here goes...not quite finished yet but I added more beads to the lid...what do you think??? 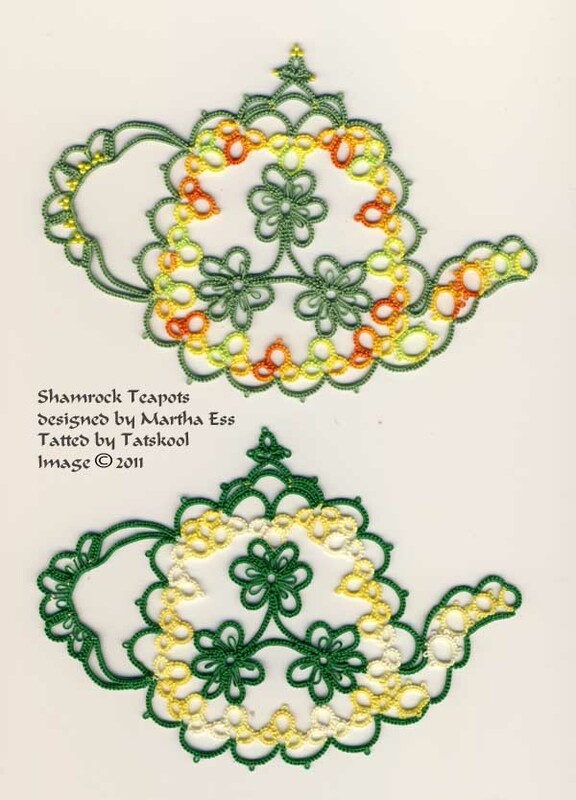 ....and the beaded teapots in 20 and 30. My Daffodil Green is darker than the Flora that i chose and gives more definition..I think. Yeah forgot to post this...and yo and behold I have finished my teapot. It measures 5.5 in from handle to tip of spout in size 30 thread. Mmm the beads on the lid give the lid a squarish look...is that good or not? I am in Teapot mode, lots more to show you....next time. They're all so pretty! 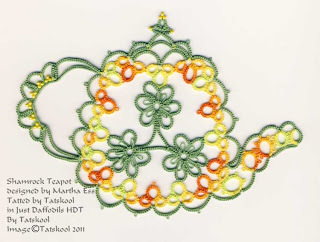 - and yes, we have become accustomed to your practice of tatting in different colours, it's one of the things I most enjoy about your blog! 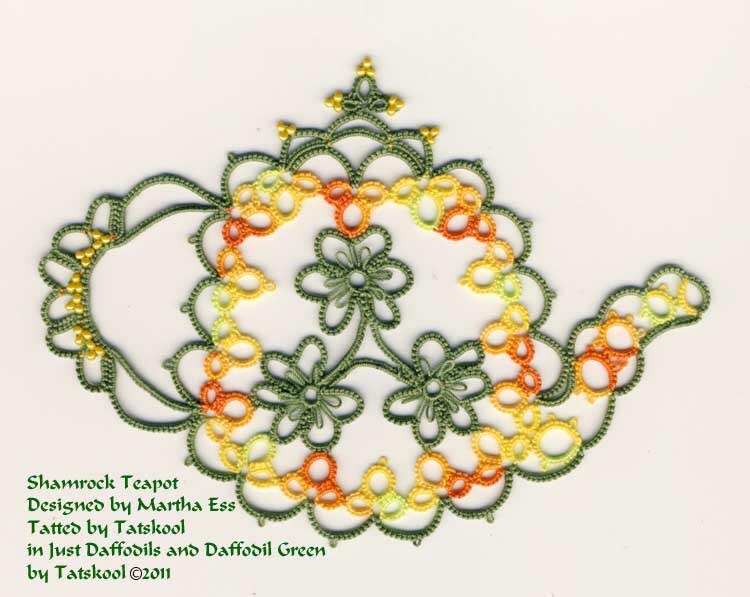 Oh, you're making me want to tat teapots but they will have to wait. In the meantime, I'll just admire yours! 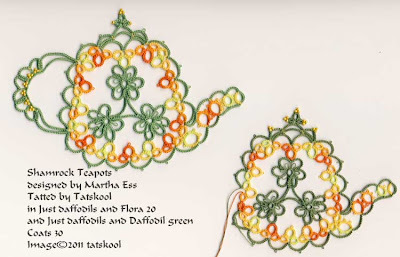 I think the teapots are fantastic, but surely it is over two years ago since you test tatted them?! Time does fly! Happy St. Patricks day to you and yours. Your teapot turn has me squealing in delight! They are all so graceful and brimming over in blushes of springtime (as well as St. Patrick's Day) color. The beads only add to their beauty. As for the lids looking more squarish, I don't see that at all. Loveliness is all I see. Maebh loves the teapots and is nettled that I have never made one. She and The Cat send much ♥ to you for St. Patrick's Day! Ans so do I! You are all my inspiration to tat, thank you from the bottom of my hearts. Ooops that should probably have read... from the bottom of my teapots! 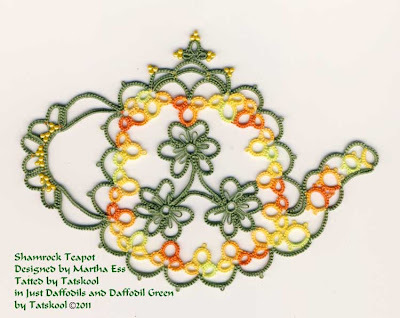 I am so bedazzled by these teapots THIS year and the ones you test tatted awhile ago! 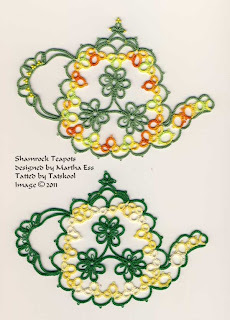 Martha's designs are so wonderful, and your different color renditions are excellent. They all look fine to me. I mentioned your blog in my post today, and how you take us on wonderful tours of Ireland. (Of course you take us to many other places, also!) I enjoyed reading those 'guideposts' by the tower, even though it was rainy. The scenery in Ireland is so amazing. I think of how my great grandparents left their homeland - we believe in the 1850s - never to see it again. Of course, circumstances were difficult at that time. 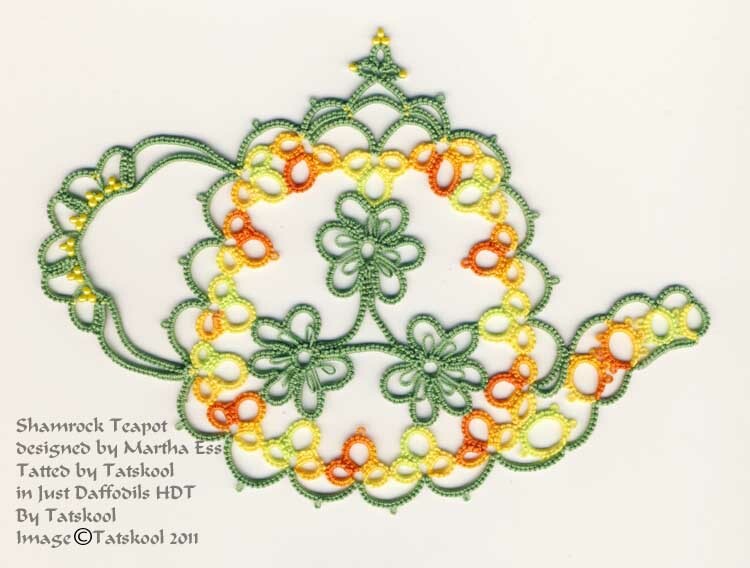 I love the beads in your teapots. Adds a lovely touch. So cheery too. Happy St Patrick's Day!! Thanks Diane Umi and Corina. Hi Kathy thanks for the link, so glad that you could read the writing on the tourist posts,they give such a good explanation. 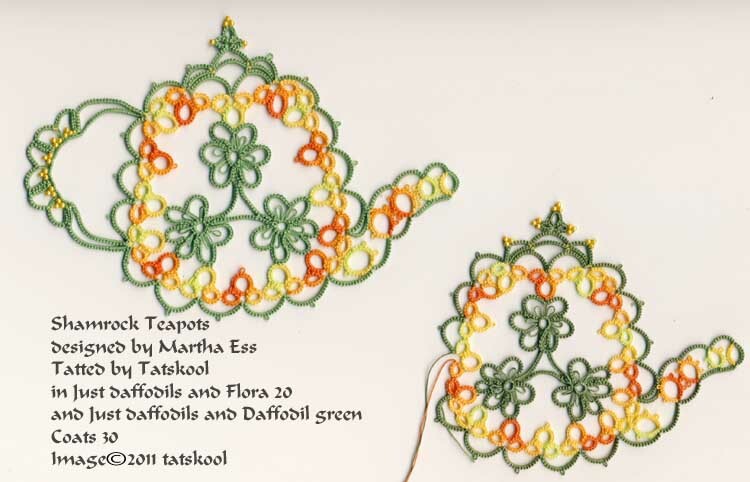 Hi Sally it is exactly 2 years since i test tatted the teapots..seems like yesterday....but doesn't everything!